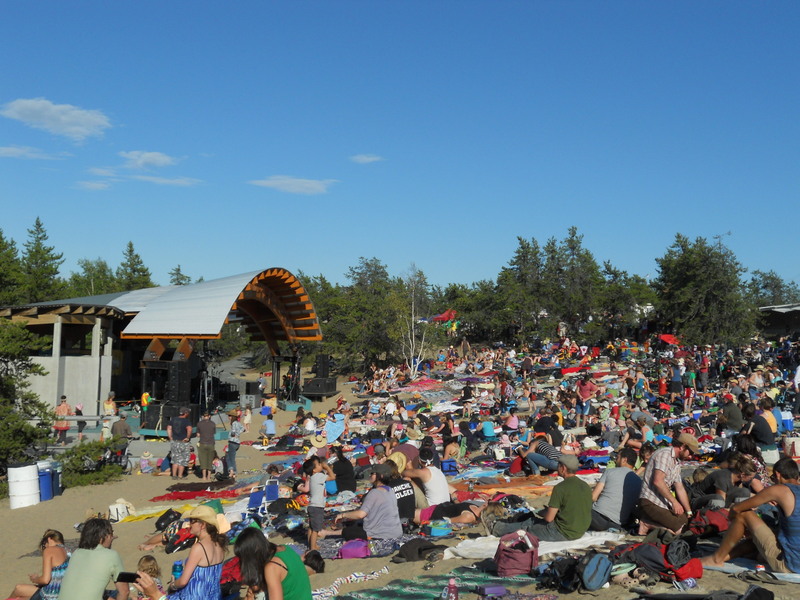 The quintessential summer music festival in Yellowknife is Folk on the Rocks. It is now in its 33rd year, and it’s the premier event of this month. Locals and out-of-town visitors alike head up to the shore of Long Lake, just outside of town, for a giant outdoor concert of predominantly folk music, all weekend long. With blankets and beach chairs, music lovers stake out their spots in the sand in front of the main stage, which acts as home base for many of them. From there, they roam around to the various stages, the cultural area, artisan/vendors’ tent, beer garden, and the food tents. It’s 50% about music and 50% about socializing, because as you stroll around, you are bound to run into people you haven’t seen in a long time. There’s an air of a beach party about this festival, although the “beach” seems to be of powdered rock rather than of sand. The landscape in Yellowknife is full of rocks, and on a normal beach grains of sand can be brushed off, but on this beach a fine dust stubbornly sticks to your feet. After a day of walking in it, when you wash your feet the water is practically black. It’s a small inconvenience for the chance to sit in the sun until late into the night, and to enjoy some wonderful energy, from both the crowd and a varied collection of musicians. Prior to the weekend, there are run-up events on the Thursday and Friday, known as Rock the Folks and Warm the Rocks. These events are headlined by some of the artists who will also play during the weekend. 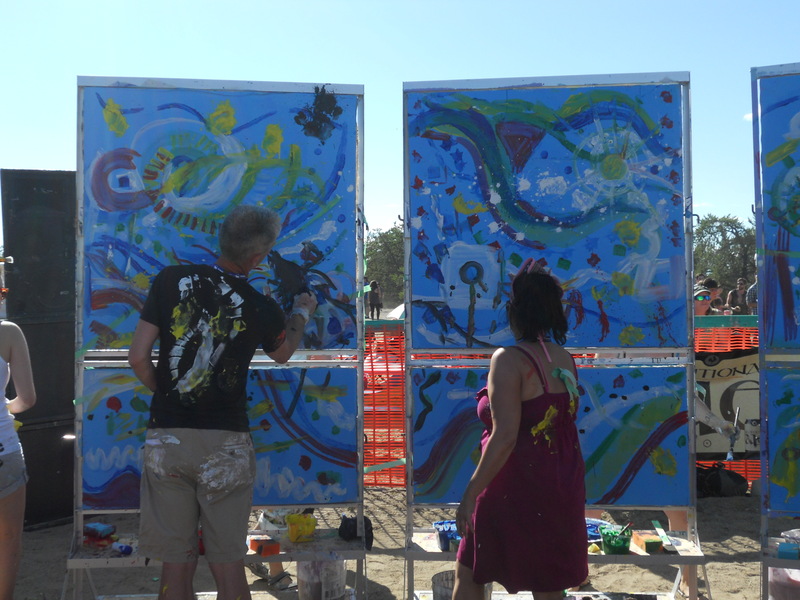 With multiple stages, including a kids’ area, and the lake steps away, it’s a real family event. Both adults and children get up and dance when the music is irresistible. The lineup is a mix of well-known artists and up-and-coming ones, of talent that’s home-grown and imported. Over the years, many bands and individual musicians have graced the various stages, and I’m sure that new talent is discovered every year. At last year’s festival, I heard for the first time what is now my favourite northern band, The Jerry Cans from Iqaluit. Their music is a lively, eclectic, can’t-sit-still mix of folk, reggae, throat-singing, and pure, infectious energy. This year, I attended the festival only on Saturday, and after a lazy morning, I arrived in time to take in Hey Ocean, a band from Vancouver. 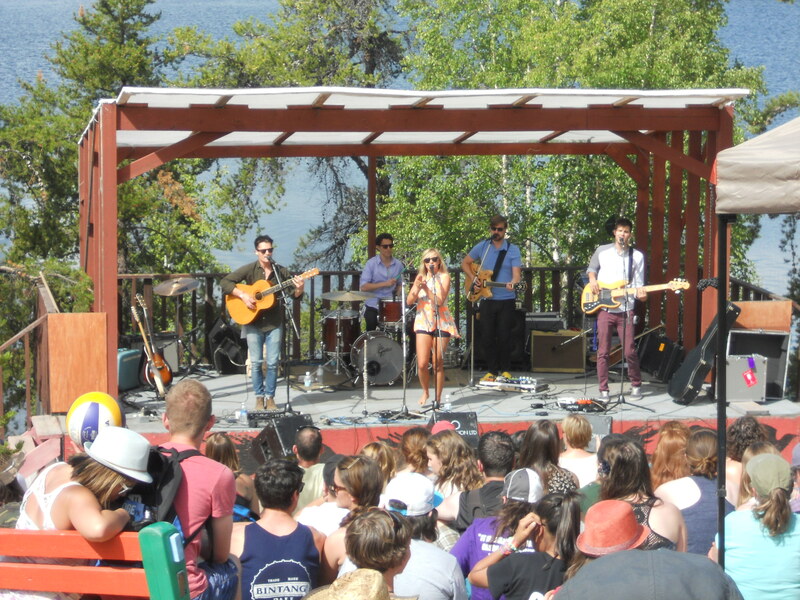 They played on the right stage, an open, picture-perfect set with the lake as a backdrop. Occasionally, boaters passing by behind this stage stop for a while so their occupants can enjoy the music, without the cost of admission. Moseying over to the beer garden, Edmonton band Owls by Nature was rocking the stage. In the programme, their music was described as “whiskey-fuelled folk rock anthems”, which was apt, for both the music and the venue. On a later trip back to the beer garden, another Edmonton band, Yes Nice, was playing. I can’t remember much of what they played, which was certainly no reflection on their music. It’s just that the height of socializing takes place in the beer garden, where the music seems to be incidental. A rather interesting side note to their act were artists from BAM (Borderless Art Movement), who simultaneously painted on large canvases, reflecting their interpretation of the music. 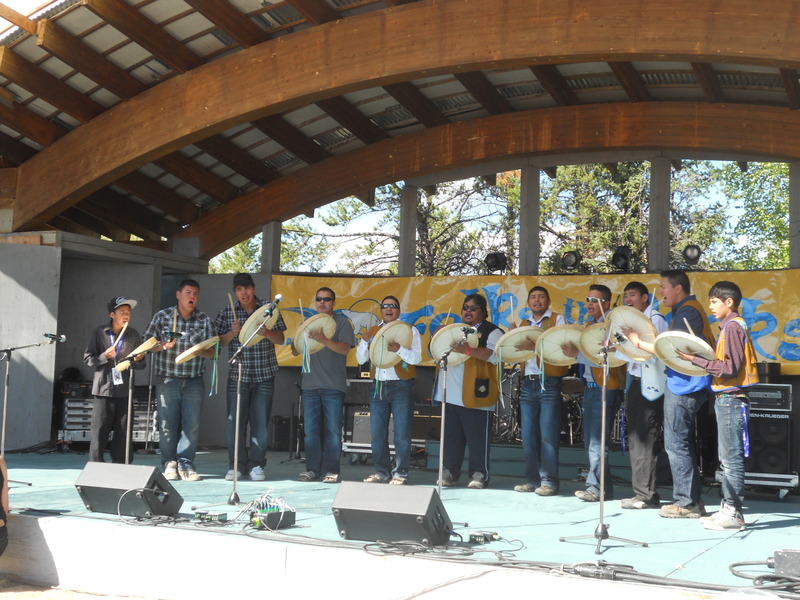 Over on the main stage, the opening act was the Yellowknives Dene First Nation Drummers, who were also featured at last month’s National Aboriginal Day celebrations. 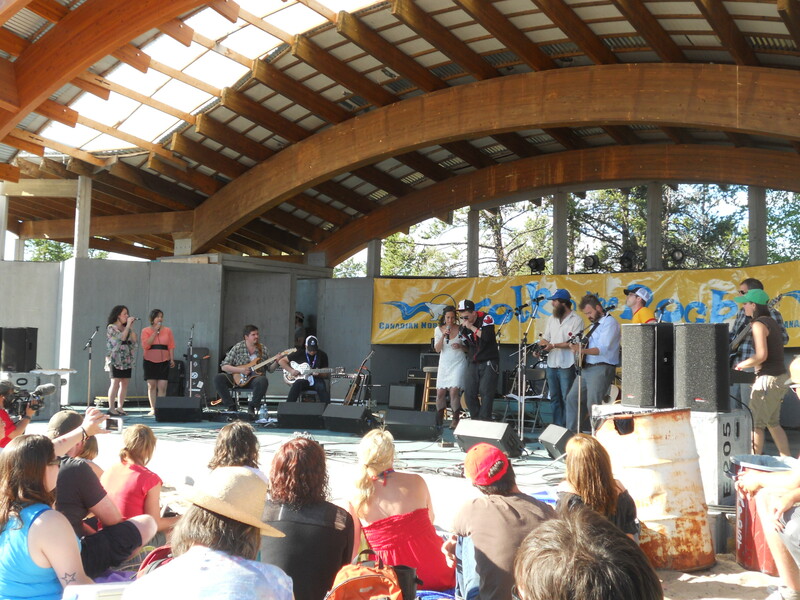 Folk on the Rocks takes place on Dene-owned land, so it was a perfectly appropriate opening act. The part of the lineup that I was looking forward to the most was the impromptu collaboration of artists, called Heartstrings this year. They each brought different instruments and talents to the stage. They were thrown together for a couple of hours beforehand, and we got to hear the results of their alliance, which didn’t disappoint. It was like a delicious stew with a little bit of this and a little bit of that. In addition to the musical harmonies of the instruments, some rapping, beat-boxing and throat-singing were thrown into the pot, and the audience was thoroughly enthralled. A newly-discovered favourite of mine was Genticorum, from Quebec. It was only a trio, but their sound was that of a larger group, and it was clear that they had excellent chemistry together. They played traditional Quebecois music, with some very lively fiddling. For one giggle-inducing song, they got the crowd to sing the chorus along with them, and it was hard to tell whether they or the audience were more entertained. 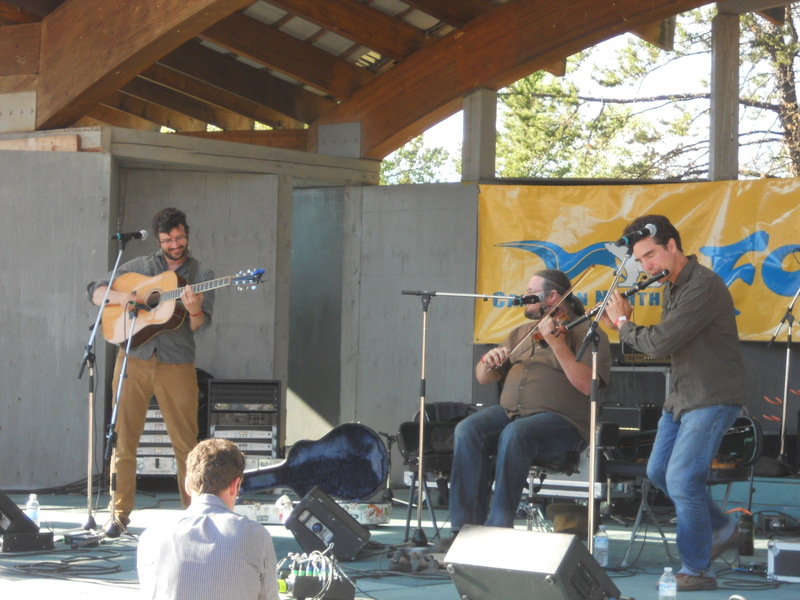 That’s what I love about Folk on the Rocks: the musicians have a rollicking good time, and so do the fans. It’s one of those weekends that you wish would never end. I’m with you on that: it really is the best event of the summer in YK! I probably saw you when I was in the beer garden trying to take a picture of BAM, without all of “the people getting waaaay too into BAM” 🙂 Glad that you had a blast. It was a great addition to the music.